This Slow Cooker Winter White Chicken Chili has a simple ingredient list and made with pantry staples like canned beans and corn. Great family friendly weeknight meal! 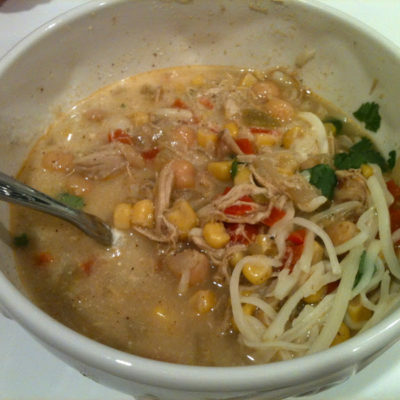 In a slow cooker, add onions, bell pepper, garlic, chicken breast, corn, beans, green chiles, spices, chicken broth and milk. Cook on low heat for 6-8 hours. Shred chicken and stir to combine. Serve bowls of chili garnished with cilantro, cheese, lime wedges and a side of tortilla chips.